I help people in business connect with each other using the medium of story. Need something more profound than PowerPoint to communicate your message? Well-structured stories give significance to data and figures, persuade on a fundamental level, and conquer limiting beliefs. I train and coach sales people, account managers, team leaders and teams to connect more effectively with their clients and each other through the medium of story. This involves combining my experience as a screenwriter and novelist with over fifteen years working with some of the UK’s largest organisations as a trainer and coach to create genuinely innovative programs and sessions. A well-structured story often changes the course of a sale. Neuroscience shows that stories engage emotionally and are invaluable when it comes to retention of facts. Both factors are, of course, essential when selling to new or existing clients. Inhibiting stories can limit performance, particularly if left unchallenged. Team leaders often attempt strategic change, when they ought to be working at a narrative level, firstly to disrupt and then to re-write. Most business decisions are made through combining data with a persuasive narrative framework. Stories engage more completely than facts alone and, as such, have more power to create an emotional response and greater connection. Success pivots on the quality of the stories we tell ourselves. Story coaching begins by assessing your current narrative, re-writing it where necessary, and then thinking about the optimal way you can communicate your new story internally and externally. 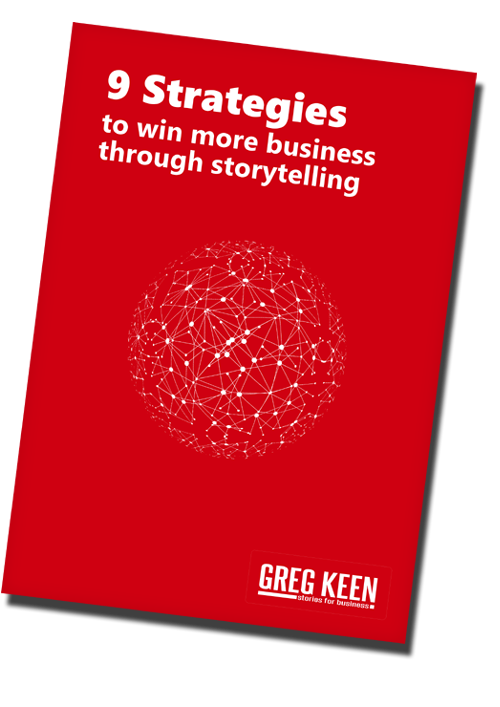 Subscribe to my newsletter and download a copy of my essential guide to using storytelling in business. “A day of storytelling training was a breath of fresh air for the whole team. Greg’s style was engaging and interactive with a variety of topics and exercises reinforcing a common theme. The content was unlike anything we’d done before and really helped us raise our game as sales professionals. In fact, we could attribute a won deal the following week to the application of some valuable takeaways from the training day. We’re adopting key aspects into our sales process going forward and the team have been quick to embrace and apply lessons learned. We just need to keep practising now!